← AM I ASLEEP AT THE WHEEL? 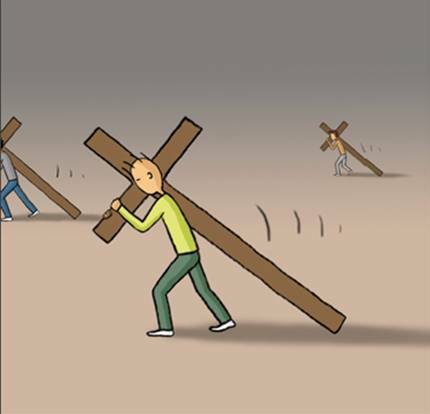 OBSERVATION: Why am I carrying His cross? As we enter into this traditional season of Lent in the Christian Church we are reminded to reflect upon the condition of our own heart and the sacrifice of Jesus Christ. The observance of Lent among various Christian traditions is practiced differently. Some don’t observe it at all, while others forsake certain foods or activities during this period leading up to Good Friday and Easter Sunday. What is supposed to be a time of sincere reflection and contemplation has turned for many into simply another religious ritual that they are obligated to observe. In essence, like Simon the Cyrene, they feel forced to carry Jesus cross! There is really only one reason to pick up our cross and follow Him. It is love. It is not our love, but His love that has been poured out into our hearts by the Holy Spirit. This is what Jesus was calling us to when He said – “Those who want to save their lives will lose them. But those who lose their lives for me and for the Good News will save them.” It is only when we lay down our lives in surrender to Jesus Christ, freely and willingly, that we enter into this life, that we become a partaker of His love. And it is this love that transforms us, empowers us, and guides us. It is only when we pick up our cross in response to His love that our worship becomes acceptable to the Lord. This Lenten season I do not want to be encumbered with “religious practices” that have the appearance of piety, but are simply done because I feel forced to “carry the cross”. I want to look upon the life and sacrifice of Jesus anew and be drawn ever deeper into His love. I want the power of His love to transform, empower, and guide me. I want to freely, willingly, and joyfully pick up my cross and follow Jesus!